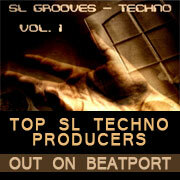 The Finest Second Life's Techno Music Producers Present SL Grooves- Techno Vol 1. SL Grooves - Techno Vol 1. is a compilation album released by the Electro Labs Label gathering the finest Second Life's Techno music producers. Second Life is a 3D virtual world where users can socialize and connect. Additionally, it gives artists an excellent way to share and test their music with other individuals. SL Grooves - Techno Vol. 1 gives the listener an excellent listening experience that slides him/her throughout the different sub genres of Techno music.